By Paige Neidig – There is something about autumn that brings romance to the air. Maybe it’s cozy campfires, sharing warm fall foods or squeezing in close to the one you love as the temperatures drop. In Adams County, Pa., there are endless ways you can celebrate fall with that special someone. Check out this authentic Adams County autumn date itinerary. Begin your date with a trip to Fields of Adventure in Aspers, Pa. Fields of Adventure is bursting with fall fun waiting to be had by children and adults alike. A favorite by many couples is the corn maze! The true relationship test is seeing how well you work together to navigate your way out of the maze. It’s a lot harder than it looks! And don’t forget to grab lunch at one of the food trucks on site. You’re sure to work up an appetite after you complete the maze. To be honest, you could spend your entire date at Fields of Adventure. They have pick-your-own-pumpkins, hayrides, a petting zoo, a zip line, pumpkin bowling, and corn hole among other fall farm activities. However, to get a complete taste of autumn in Adams County, I’m recommending you come back to Fields of Adventure another day, and head out to one of Adams County’s farm markets next. Enjoy the drive through Adams County’s orchards and hillsides on your way to a market. Pennsylvania is the fourth largest producer of apples in the United States, and Adams County has the highest apple production in the state – so clearly, there is no shortage of orchards to be admired and apples to be picked. Hollabaugh Bros. Inc. Fruit Farm and Market and Boyer Orchards in Biglerville, Pa., are two great stops for a pick-your-own experience. Part two on your authentic Adams County autumn date is taking a casual stroll through the bountiful orchards and picking the biggest, juiciest apples from the trees. Enjoy them fresh from the trees, or take them home to bake into an apple pie – either way, you’re getting a true taste of authentic Adams County! If the thought of freshly baked apple pie, apple crisp and apple dumplings has your mouth watering, it sounds like it’s time for dinner. One thing that makes Gettysburg especially alluring in the fall is its haunted experiences. Many old buildings in Gettysburg have their own history, legends and hauntings – including restaurants. Continue your authentic Adams County autumn date with a romantic and spooky dinner at one of these haunted restaurants in Gettysburg. If dining in a haunted restaurant wasn’t enough to spook you, take a ghost tour of the town. Considering the tragedies that occurred in the small town of Gettysburg back in 1863, it’s no surprise that many visitors tell of paranormal activity they’ve encountered during their time spent in Gettysburg. If you’re brave enough, venture out after dark, take a guided tour of the town and listen to the many stories that have been collected of other-worldly happenstances right here in Gettysburg. You’ll want to pull your date in close, because you may leave with some of your own ghost stories to tell! Who doesn’t love the flavors of fall? End your date with a toast to each other with one of these five flavorful fall drinks. Whether you’re an apple, pumpkin, or cinnamon spice lover – there will be something for you in Gettysburg. Our cocktails are extra special because many are made with ingredients we produce right here in Adams County! If you’re not ready to leave quite yet, spend the night at one of our campgrounds. Continue your fall fun by roasting marshmallows over the campfire and falling asleep to the sounds of nature all around you. 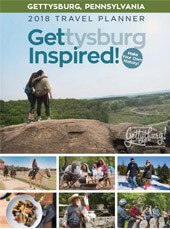 The possibilities to celebrate autumn in Gettysburg are endless. What’s your favorite fall date to go on with your significant other in Adams County?